In August, Soundsmiths was pleased to master a new album (vinyl, CD and streaming) from Georgia blues rock artists Myke Carroll and ArcLight. Their latest project is titled Patton Avenue. Hailing from the North Georgia mountains, Myke Carroll (lead guitar), M.D. (Mike) Marine (bass and lead vocals) and Johnny Weaver (drums) have been playing together for 27 years. They sometimes joke about having over 200 years of performing experience between them. They started together in 1991 as session musicians at a local studio. Mike Marine was a recording engineer there, but they would all jam together on breaks and after hours, exploring blues, rock, country and jazz elements. They developed a power blues-rock style with some solid jazz underpinning, especially from Weaver who was a big Buddy Rich fan. Myke says Johnny is one of those musicians who never fails to surprise his listeners and can hold an audience spellbound with nothing more than a hi-hat and a pair of sticks. Myke’s lead guitar style leans heavily on a warm, massive signature guitar tone, and a gift for exploring and twisting the secrets from a melody without losing it. Mike Marine’s bass style is a little bit bluesy, a little Motown, a little of Stanley Clarke, and always a powerful anchor and musical counterpoint. His lead vocals are characterful, soulful and emotionally charged. Eventually, they began performing publicly and were soon opening for such acts as Marshall Tucker, 38 Special and Steppenwolf. They performed the music for a Bud Lite TV commercial and toured extensively. But the big, next-level break proved elusive. They were once on the threshold of a record deal, in a country music “new artist development” project at Warner Brothers in the late 1980s. Due to personnel issues they finally lost out to the other act in the development project, Travis Tritt. That release went on to become one of those rare gems that has a cult following among other musicians (guitarists especially) and got substantial radio play in places as diverse as Charlotte and stations in Asia. As they recently began writing and recording again, along comes Muddy Welles (slide guitar) who witnessed one of the 72 Hours-era concerts as a teen, and became a fan. 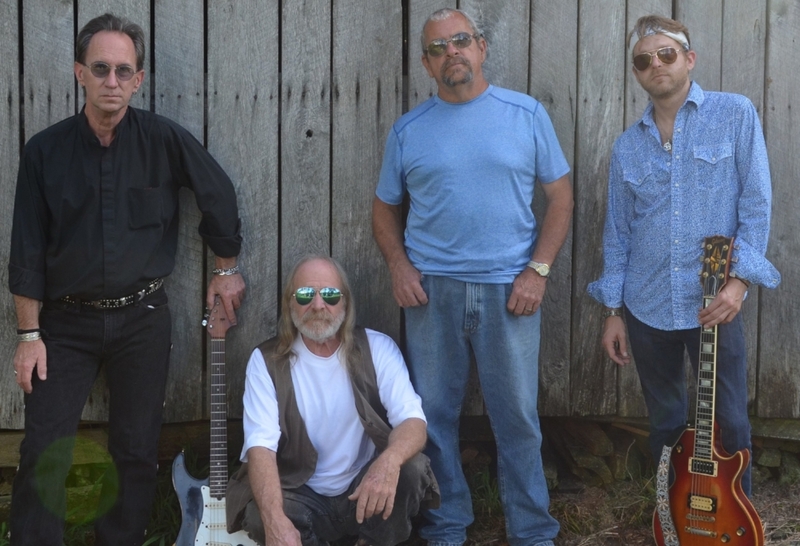 A bluegrass virtuoso until switching to slide a couple of years ago, Muddy is now the band’s newest member, at times supporting Carroll’s lead with power chords, and at other times taking soaring, tasty slide solos himself. The new album, Patton Avenue, recorded at Echo Mountain in Asheville, and mixed by Clay Miller, showcases the band’s individual virtuosity, ensemble chops and stylistic range. The band was joined by Ashli Rose (backing vocals) and Jim Aaron (harmonica). My biggest challenge was to make the sound as BIG as it aspires to be without sacrificing the gorgeous warm tones present in the mix. Clay Miller attended the mastering session along with Myke and M.D. We did a second master for the vinyl release. The band has graciously agreed to allow me to feature a track from the upcoming EP. I chose a bluesy ballad because I think it has the most crossover audience appeal, but once the album is out, I may switch it out for a more up-tempo tune. I like this one for the way everybody contributes such tasty, understated licks, while Mike Marine’s heart-rending vocals rip a whole in the fabric of time. Emotion is set to ‘high’ in Every Man’s Apology. Check back for links to the EP and eventually the CD, vinyl and online versions as soon as they’re released! Meanwhile, here’s a video that features interviews and footage from the Patton Avenue recording sessions at Echo Mountain studios.